This is birthday I created by adopting from a Mango Mousse Cake ->Bisousatoi-mango-mousse-cake. When I am searching for recipe, this recipe attract me with the beautiful picture and the cotton cake in it. I am looking for a cake base that is not easily shrink and give me a light texture so I decided to give this cake a trial with some tweeting in the mousse. The reason I would like to incorporate yoghurt in the mousse is to bring a different favour to the cake compare to the normal mousse cake. Another more realistic reason will be , I cannot find some good mango in the market . Gosh, just when I thought is the mango season, it just seem goes pass too fast . Well is not this always the case, when you want something, you can not find it. When you do not want it , is always flashing in your eyes. 1.Preheat oven 150C. Line the square tine with baking paper and wrap bottom of the pan with aluminium foil. 5.Fold 1/3 of the egg white gently into the egg mixture till combine well. Continue to fold 1/3 of the egg white into the egg mixture till all finished and well incorporate . 6.Pour batter in the baking tin and tap out the air bubble on the bench tap before baking. 7.Bake the cake in a bath of hot water for about 45min. 8. Once the cake is baked, let it cool and slice horizontally into 2 slices and trim them into 6"x 6" square. 1. In a metal mixing bowl, whip the cream with icing sugar till soft peak and refrigerate to chill. 2. In a small bowl , pour in the water and sprinkle gelatine powder, let it bloom. Sit the bowl on a bigger bowl of hot water to dissolved it. 4.Add the mango yoghurt mixture well with the whipping cream till well combine. 1. Place one of the cotton cake in the tin, pour half the mango yoghurt mousse in it. 2. Level the surface and make sure the side is cover well. 3. 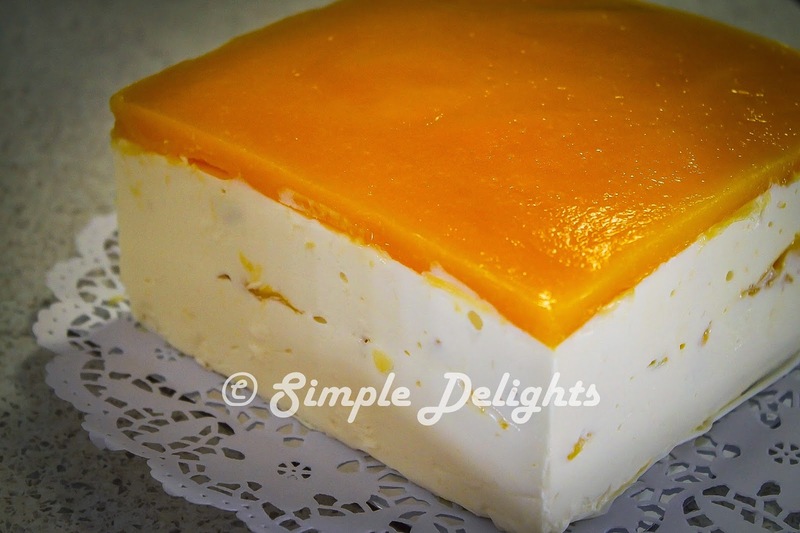 Layer the slice mango on top of the mousse and place another cake slice on top. 4. Pour in the reminding yoghurt mousse to the cake and smooth the surface. 5. Chilled in the fridge for about 2 hour before pouring the mango jelly/glaze. 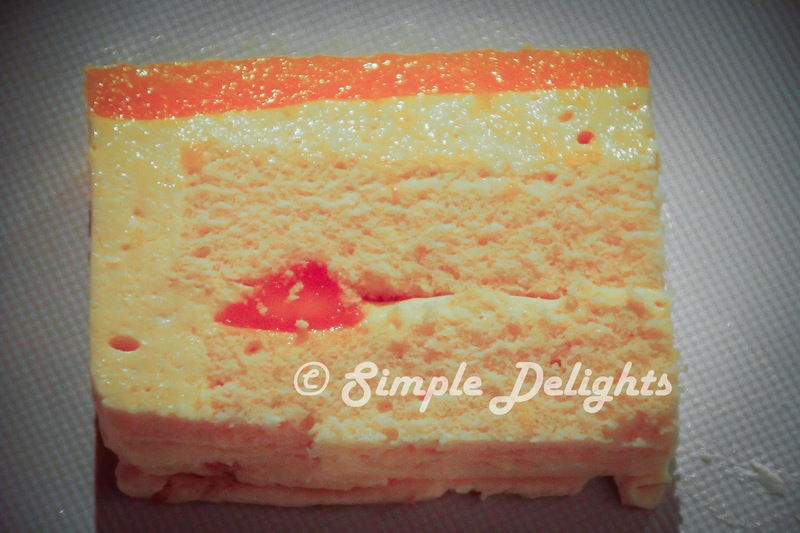 Take the chilled cake out from the fridge, layer with some slice mango and pour the mango jelly on top. Refrigerate the cake for another 3-4 hours before serving. The cotton cake is not as light as sponge cake. The texture is more dense then I expected. The original recipe does not put any vanilla essence, I find the cake is too eggy without the essence. The texture of the cake is more firm and it does not shirk. The method of the cake is like a chiffon cake yet using butter instead of cooking oil . Is like a sponge cake method yet not beating the egg yolk to fluffy and is bake in steam bake method. I make 2 of this cake , one for a birthday celebration another one is for a customer order. The feedback from customer was the cake is dense and firm . They prefer the light fluffy sponge cake texture compare to this. I personally think the same as well. Maybe it will be some people liking if they prefer a dense cake then expect something that is light.